Slightly delayed post, but I wanted to wait for these faces! Shown are Sakura Park, Summer, and Telia Evenway! Although it’s not visible on a white background, Summer has a faint white glow around her. 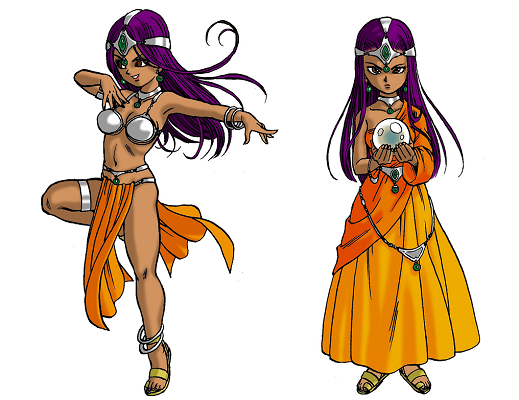 Not much trivia this week; Telia’s original 2000-2001 name was Jeria, but in Japanese katakana that’s indistinguishable from Jelia, so it had to change. I’m definitely hoping to one day be able to release Dreamblazers in Japanese; if a bunch of people throw money at me to have it in Spanish or any other language then of course I’ll do that too for the sake of catering to my own audience, but speaking personally, I’d love to give back to the country responsible for ~95% of my favorite RPGs. Anyway, the first reason I wanted to wait for these portraits is that I want to keep posting faces while I still can. 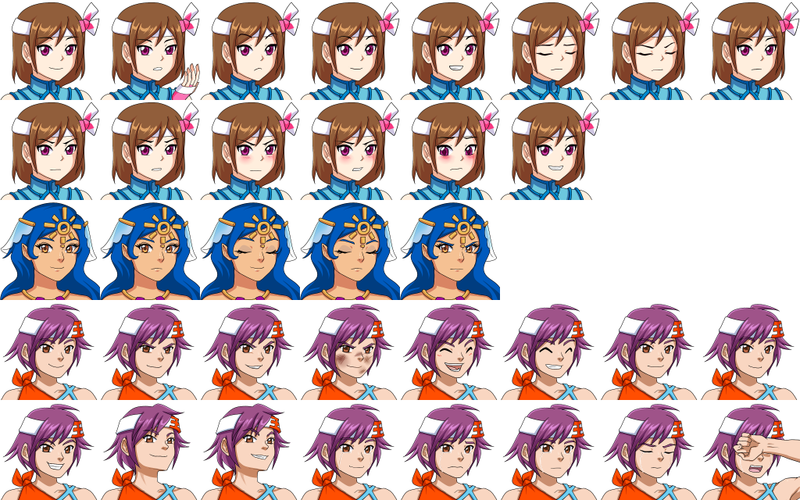 As crazy as it might seem since I’ve only been putting up Flora’s portraits for a few weeks, we’re almost at the end of new characters getting faces. More faces will be filled in and posted in the weeks to come—for example, seeing Telia’s wide range of faces makes me want to give some similar ones to Celty—but in terms of characters who have no faces at all yet, there are only a tiny handful more. 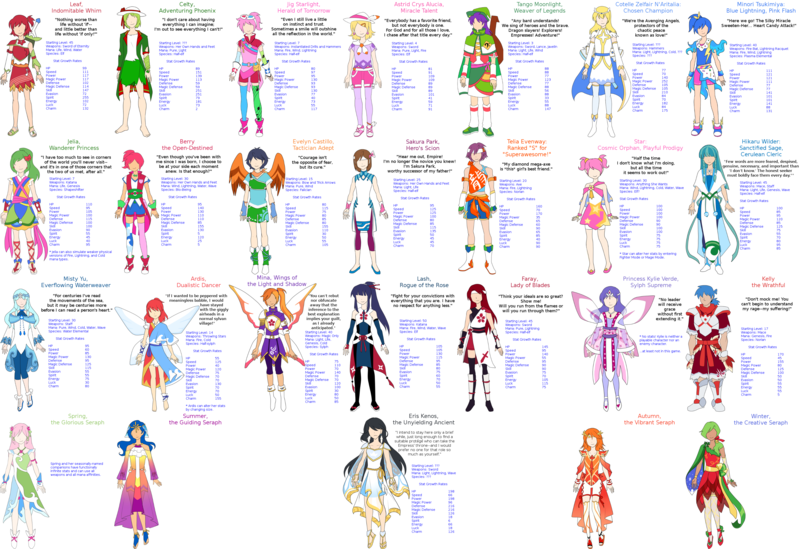 Out of all my (finished) characters, Cotelle, Minori, Berry, Star, Hikaru, Misty, Mina, Faray, Kylie, Eris, Autumn, and Winter aren’t needed at this time since I only want a minimum to put out my playable demo as a proof of concept. …and that’s also the second reason I wanted to wait since everything I’ve said is a perfect segue to my next point! 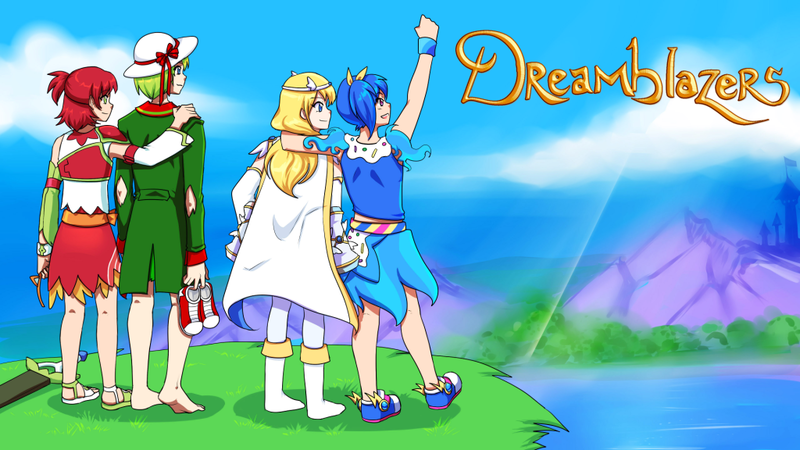 When I first decided on this crazy journey for my life in 2012 after learning about the existence of Kickstarter, I initially wanted to put out a pretty massive demo to the tune of two or three hours long—a demo encompassing all of Miharu, the entire first continent of Dreamblazers. My instinct was that since I’m an unknown and technically unproven developer, I needed to deliver a ton of value up front. It would be like the archaic shareware days and that’s how I grew up: playing the very meaty demos of Spiderweb Software’s Exile series (later remade as the Avernum series). 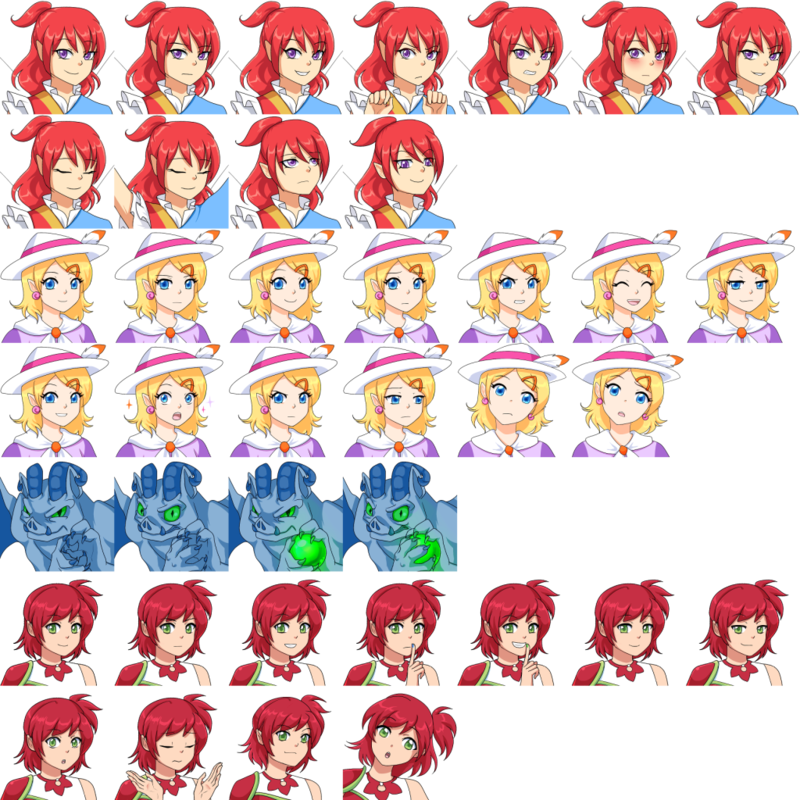 To put into perspective how many locations all of Miharu would require, I’ll take a look at my placeholder version. Note that these are free tiles from OpenGameArt, not Becca’s sure-to-be-far-more-professional tiles, and since they’re just placeholders I don’t always have the applicable art; as one example, the big cluster of houses in the northwest is just my stand-in for a pixel art castle that I don’t have yet. Also, the scale and shape of the continent are going to change for the larger. (Click for full size.) 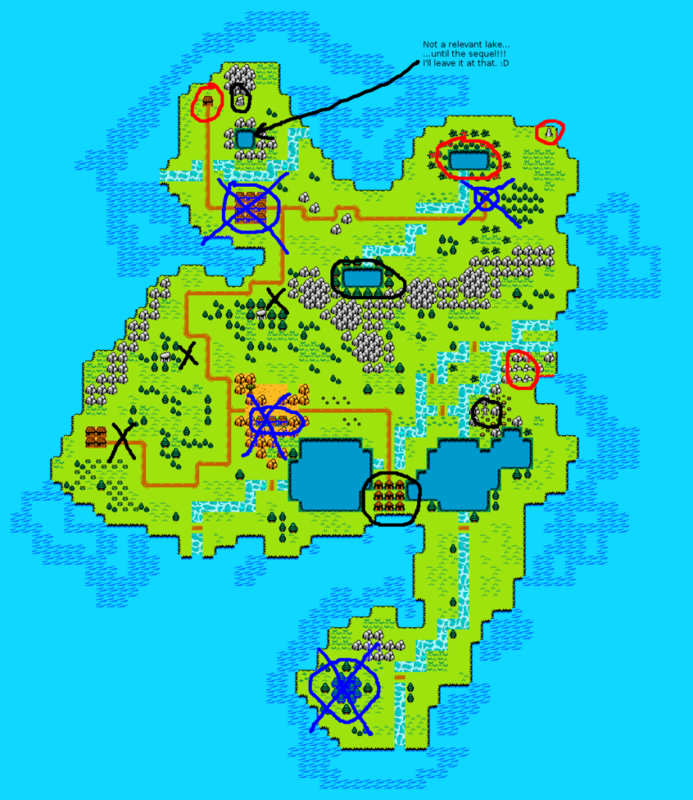 Places circled in black are fairly big, places circled in red are very small (e.g. one house in the middle of nowhere instead of a town), and places with an X are suspicious-looking areas that were never going to be possible to enter even from the beginning. Small locations are vital, by the way! Of course, SNES RPG dungeons were sometimes only one or two rooms, but that's exactly how they bring out gameplay variety. As it currently stands, that leaves a total of eight areas still in play, but I’m considering cutting still a couple more. Why? Two main things have put me at a crossroads. How much do I need to do? And why am I doing it? These are the questions I face because of some thought-provoking stuff that happened to me last week—so let me go ahead and zoom in on those two main things. 1. A lot of the reason for a massive demo is obsolete now. …I realize that as my game has grown, so have I. Of course the 2012 amateur who had never done or spent a single game-related thing outside of Word and Excel would feel a need to put out a huge demo—I had so much more of myself to prove. If I said “I’m absolutely going to finish Dreamblazers” in 2012, no one would have any reason to buy into that. In fact, the most important detractor who I had to convince might well have been myself. But now I’ve coded some game scripts (actually coded, not just tweaked settings in ORK Framework or 2D Toolkit), I’ve put in over a year of time, I’ve assembled a wonderful team (and one that’s still to grow! ), and I’ve spent a little over $10,000. Without even realizing it, I just so happened to fake it ’til I made it, trusting without any preceding evidence to go on that every dollar spent would pay off for me and everything would come together. And I’m not on my own anymore. I’ve gathered professionals; both Flora and Becca have created art for other games as well. When I say “I’m absolutely going to finish Dreamblazers” in 2015, it carries weight. I don’t need a three-hour demo to back that up. It would still be great, no doubt about that! But maybe a one-hour demo will suffice. 2. The time factor is creeping up on me. If I’m being honest, I should have gone after pixel artists months and months ago. Not doing so is by far my biggest blunder throughout this game dev process—and it’s not like there was no competition among my blunders. That crazy moment when, after a year of churning away, you finally decide that maybe your Unity assets' user guides are worth reading. I put off the quest for pixel art because I wanted to do everything that I could on my end for the gameplay and story fronts, but I inadvertently created a bottleneck this way. Right now it’s a trifle for me to add the gameplay of as many areas of Miharu as I feel like, so I can go as big and bold as I could ever want; the story is a bit more difficult, but not at all an issue by my soft deadline of July. As for music, I could probably get by with only having three pieces for towns, dangerous areas, and the overworld, then fill out the rest later. The trouble is that the more caves, forests, or mountains I include, the more pixel art environments I’ll need and the more pixel art enemies I’ll need. Money-wise this is no issue, but time-wise it’s getting increasingly uncomfortable to push up against a deadline (soft or not). This is more psychological than tangible, I suppose, but I’m definitely feeling a crunch now and I don’t see any way to take shortcuts here. Because nothing is and nothing will ever be more important to me than gameplay, I’d much rather cut an entire area than put it out there with a third as many enemy types as it should have. …but it’s one thing to see another person having to delay and another much tougher thing to be the person doing it. And I’m not even at that point! I don’t have to delay yet! I’m just facing the fear that it could happen depending on my choices going forward. I’ll wrap this post up here. What’s the scope I should aim for? Why? How? After overcoming almost all of the gameplay-related obstacles (AKA understanding-how-stuff-works-in-Unity obstacles), these are the new challenges I’m facing and this is the snapshot of where I’m at in the process. 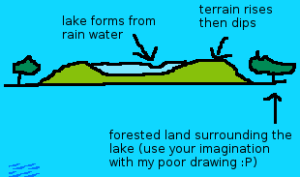 This entry was posted in Devlogs, Dreamblazers, Dreamblazers Trivia, Video Game Art and tagged Avernum, Exile on March 11, 2015 by JellyPaladin.